March 22, 2011, 10 a.m. In two years, Amazon moved from journalism savior to afterthought; is today the day the trend reverses? By Tim Carmody @tcarmody March 22, 2011, 10 a.m. In the brief moment between last week’s unveiling of The New York Times’s new smartphone- and tablet-centered subscription plans and today’s launch of Amazon’s Android Appstore, it’s worth taking a short historical detour, if only to see how differently the world looks today from the time, not long ago, when the Kindle was supposed to be a big factor in getting people to pay for journalism. This is partly a result of earlier negotiations between the Times and the e-bookstores. But it’s clear that the NYT’s digital strategy today is focused on the web browser for the desktop and applications for mobile. E-reader subscriptions today, for better or worse, are minor players — legacy obligations. With that in mind, it helps to understand how we got here, and why. Less than two years ago, between “countless meetings” and furious debates over how to secure The New York Times’s digital future, publisher Arthur Sulzberger appeared on stage with Amazon CEO Jeff Bezos to announce the new Kindle DX. In 2009, Amazon owned the mobile market for screens six inches and up. No other e-readers had a comparable marketplace. Barnes & Noble had yet to launch the Nook, let alone the NookColor. Apple’s first iPad and the wave of tablets that continue to follow it were still a year away. The Times, along with the Boston Globe and Washington Post, even agreed to subsidize digital subscriptions for readers outside their print delivery areas with the purchase of a new Kindle DX. For the Times, that subsidy amounted to a free one-year subscription and a New York Times-branded Kindle cover. On its own terms, the Kindle is even more successful today than it was in 2009. The Kindle 3 is Amazon’s best-selling device in its history; more importantly, it generates millions of dollars in ebook sales for Amazon. Even the explosion of color tablets has arguably been good for Amazon’s ebook store; the company’s mobile apps extend the reach of its marketplace while its most loyal readers gobble up books on the Kindle. Amazon’s also continued to innovate in its support of journalism, with Kindle Singles providing a new platform for long form pieces that don’t fit in the current economics of either books or periodicals. But you rarely hear anyone talking about Kindle subscriptions as either the savior or future of newspapers or magazines any more. On Amazon’s Kindle DX page, newspaper and magazine subscriptions occupy a slim space at the bottom, together with blog subscriptions and well below books, PDFs, and built-in access to Wikipedia. There’s a short note on newspaper navigation that mostly advertises the DX’s five-way controller and clip-and-save capacity. (Textbooks, the other original raison d’être of the Kindle DX, go unmentioned altogether.) Despite its augmented capacities — I’ve written admiringly about them elsewhere — the Kindle, including the larger DX, is a machine (in both senses) for selling and reading books. It’s telling that Kindle Singles, Amazon’s most exciting contribution to the journalism marketplace, essentially converts a periodical article to enlarge the market for ebooks. And it’s telling that Apple’s most influential contribution to the journalism marketplace has been the conversion of periodicals into apps. In retrospect, Amazon was prescient in targeting a 9.7-inch screen for periodicals. But several features have tilted the market towards tablets and away from e-readers. Some of the most decisive may not be the first that come to mind. The immediate advantages of a tablet like the iPad over an e-reader like the Kindle DX are color, multimedia, touch, richer interactivity, and a wider marketplace. Kindle users trade that for readability, battery life, and a simpler content-buying experience. For content creators like The New York Times, however, the revenue streams for the two devices are quite different. Even though Apple now asks for 30 percent of subscription revenue sold within its own app store (and zero for subscriptions sold via NYTimes.com), Amazon’s cut was once far steeper, taking 70 percent to the publisher’s 30. The company’s since moved to a split virtually identical to Apple’s for books and periodicals $2.99 and higher — but Amazon doesn’t have a comparable mechanism for current print subscribers or anyone who subscribes outside of Amazon’s own store. Even more significant, however, may be the difference in advertising revenue. Currently, Kindle periodicals like the NYT are ad-free. Mobile applications can offer not only interactive, multimedia ads, but can easily offer advertisements scaled for handheld- and tablet-sized devices. What’s more, demographics for mobile devices and the Kindle differ wildly, with the Kindle skewing older (although those figures are likely closer now than they once were). Even six- and seven-inch tablets suffer from diminished ad revenue potential compared to ten-inch devices like the iPad, as Gannett’s Craig McKennis noted last year. Meanwhile, the Kindle DX has amazing screen estate, but keeps it all for itself. Today, Amazon launched its Appstore for Android devices. It’s a remarkable challenge to Google’s official Android Market, as well as an admission that the market for mobile apps has grown too big for a digital retail giant like Amazon to ignore. And it’s a challenge to Apple, which has filed a lawsuit against Amazon for use of the contested “App Store” trademark, and can’t be happy to have the powerful retailer competing for user mindspace and exclusive access to developer’s apps, even on another platform. But the Appstore is also potentially a barometer for Amazon’s future role in the economics of the news industry. Applications, not subscriptions; 30/70, not 70/30; availability on multiple devices and platforms, both analog and digital; control of the marketplace above control of the device or the content. This is largely the emerging conventional wisdom for publishing today, which Apple embodies and Amazon has adopted. It’s also part of the universe in which The New York Times’s new subscription plans appear, and in which they will thrive, fail, or limp along. People will be able to download the app store on their handsets, but what’s more likely is that Amazon will partner with device makers to ship gadgets with Amazon as the default app store. A few things will set apart Amazon’s app store from Google’s. The first is curation — Amazon will try to strike a happy middle between Apple’s sometimes crazy restrictions, and Android’s free-for-all. Another one is pricing: developers can set a “list price,” but Amazon reserves the right to heavily discount apps. And finally, Amazon will offer app recommendations, like it does on its web site. Pre-launch, tech blog AndroidNews took screenshots of a prematurely-available page that seem to confirm that Amazon will be offering apps at lower prices than Google’s marketplace. The apps predicted to appear are mostly games, although Newsweek Mobile’s app also makes an appearance (at a discount). Let’s assume that Amazon’s Appstore becomes a success, and that it does, in fact, become the default store for a handful of manufacturers and users who prefer it. If news applications largely do appear there, that’s significant for both publishers and Amazon, because the retailer will be continuing to play a role in the dissemination of news and revenue. If news apps largely don’t appear in the Appstore, that’s also significant — because there will be a class of devices and readers who will be harder to reach. The most intriguing but also the most speculative scenario for Amazon, in light of its new app store, is that Amazon itself might launch an Android Kindle, a multimedia tablet to rival the iPad, NookColor, and others, using the Appstore as a base. Nick Bilton at the NYT recently observed that Amazon is hiring Android developers, while rumors of an Amazon Android tablet are nothing new. An unexpected hurdle for such a tablet might again be legal. Yesterday, Microsoft filed a lawsuit against Barnes & Noble claiming its Android-based e-reader violates several of Microsoft’s patents. Last year, Microsoft and Amazon made a broad patent cross-licensing agreement for the Kindle and other technology, but it’s not known whether and under what conditions that agreement would permit an Amazon-branded multimedia tablet or prohibit it. Like Frommer, I think it’s unlikely that the mainstream Kindle will be radically altered. It is simply too successful for what it is. The Kindle DX, however, is something else entirely. It’s too close to the iPad in both size and price to be just a large-print Kindle with 3G access. The original initiative behind the DX, to grow a marketplace for Amazon beyond the book, remains unmet. A ten-inch multimedia tablet backed not just by Amazon’s Appstore, but by its selection of ebooks, music, movies, games, and more — fueled by Amazon’s unparalleled payment system, offering one-click access to millions of credit cards, and driven by Google’s operating software — would meet that need. What’s more, Amazon plus Google may be the most dangerous competitor Apple could face. The open question would be whether such a “Googlezon” tablet would need to carry the Kindle brand, or whether (like “Wintel”), they could set the market standards for an ecosystem of third-party manufacturers. A persuasive looking analysis in the Business Insider put the cost of printing and distributing the New York Times at $644 million, and then added this: ‘a source with knowledge of the real numbers tells us we’re so low in our estimate of the Times’s printing costs that we’re not even in the ballpark.’ Taking the lower figure, that means that New York Times, if it stopped printing a physical edition of the paper, could afford to give every subscriber a free Kindle. Not the bog-standard Kindle, but the one with free global data access. And not just one Kindle, but four Kindles. And not just once, but every year. And that’s using the low estimate for the costs of printing. 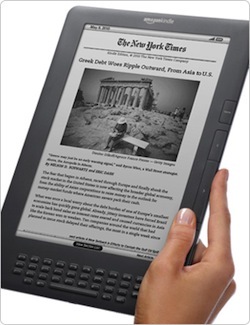 But that future leaves us where we were in 2009: with Jeff Bezos and Arthur Sulzberger sharing a stage, holding a $400 E Ink reader that offers subscriptions without paper or advertising. It’s an open question whether that vision or another will win out in the years to come. POSTED March 22, 2011, 10 a.m.
Carmody, Tim. "In two years, Amazon moved from journalism savior to afterthought; is today the day the trend reverses?." Nieman Journalism Lab. Nieman Foundation for Journalism at Harvard, 22 Mar. 2011. Web. 20 Apr. 2019. Carmody, Tim. "In two years, Amazon moved from journalism savior to afterthought; is today the day the trend reverses?." Nieman Journalism Lab. Last modified March 22, 2011. Accessed April 20, 2019. https://www.niemanlab.org/2011/03/in-two-years-amazon-moved-from-journalism-savior-to-afterthought-is-today-the-day-the-trend-reverses/. | title = In two years, Amazon moved from journalism savior to afterthought; is today the day the trend reverses?